We’d love your help. Let us know what’s wrong with this preview of Apex Predator by M.T. Anderson. The journey through the rift becomes even rockier as the survivors are forced to take to the water, crossing a vast lake on improvised boats. But halfway across, they discover something is tracking them from deep beneath surface, a colossal monster that's stranger--and larger--than anything they've encountered yet. New York Times bestselling author and National Book Award wi The journey through the rift becomes even rockier as the survivors are forced to take to the water, crossing a vast lake on improvised boats. To ask other readers questions about Apex Predator, please sign up. I've really been enjoying this YA adventure series, in large part because of Johnathan McClain's reading skills. Audiobook producers: please employ this guy for lots and lots of audiobooks! To quote Syndrome in The Incredibles: That sounds a little dark for you. This book is like the Toy Story 3 of this series! (And that's it I'm done referencing kids movies). This was a lot darker than the first three. I don't know if that was planned, or if that's Anderson's contribution. 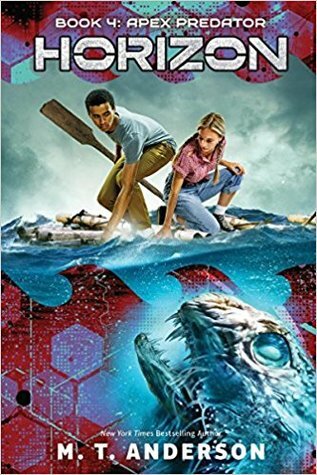 This is my first time I've really been enjoying this YA adventure series, in large part because of Johnathan McClain's reading skills. Audiobook producers: please employ this guy for lots and lots of audiobooks! Team Killbot and their new friends have seen almost everything they can imagine. They've survived a plane crash into the Artic, only to find a tropical rainforest environment with deadly animals they've never seen before. They've crossed the tropics to find a desert, only to find a swarm of robots battling for their lives. They've encountered technology that can break any and every rule of science, and animals that can tear apart lives in a mere matter of seconds. They've met people who have bee Team Killbot and their new friends have seen almost everything they can imagine. They've survived a plane crash into the Artic, only to find a tropical rainforest environment with deadly animals they've never seen before. They've crossed the tropics to find a desert, only to find a swarm of robots battling for their lives. They've encountered technology that can break any and every rule of science, and animals that can tear apart lives in a mere matter of seconds. They've met people who have been trapped in this strange place since the 1970s. But a humongous sea, full of strange predators and guarded by gigantic cyborg monsters? That takes the cake, especially since their way back home might be just across the sea. Will they be able to survive without both monsters and jealousy tearing the team apart? I've followed this series since the beginning, watching the characters evolve and devouring each book's unique twists and turns. I'll admit, I'm always unsure of series where each book is written by a different author, each with different writing styles. I was pleasantly surprised, though, when it worked so well in Horizon. The characters are perfectly imperfect, each of them seeming just as real as I am. The dynamics between the characters are also deeply realistic. In fact, I have yet to find a character that doesn't react to a situation realistically, just like I have yet to find a plot hole in the series. I personally think the actual plot of the book was terrifying, but I wouldn't dare put it down for a second. It's written in a gripping and exciting style, hooking you in and never letting go. Apex Predator is scary, gripping, and undeniably good. Even if you're not usually into this genre, you should give it a try. Trust me, you won't be able to put it down. Both the members of the robotics team whose plane went down and the members of the Cub-Tones from the 1950s are still surviving in the scary land of the blue broccoli forests, dealing with exploding fruit and scissor birds. They do find a statue and a tree village, but still do not find any inhabitants. They do come across a journal from a whaling ship in 1855. This shows them that the world they are in has existed for a number of years, but is also an ominous warning that people have been trapp Both the members of the robotics team whose plane went down and the members of the Cub-Tones from the 1950s are still surviving in the scary land of the blue broccoli forests, dealing with exploding fruit and scissor birds. They do find a statue and a tree village, but still do not find any inhabitants. They do come across a journal from a whaling ship in 1855. This shows them that the world they are in has existed for a number of years, but is also an ominous warning that people have been trapped within it for lengthy periods of time. The children discover that music tends to calm one type of giant cyborg, but they also suffer a tragic loss. With Molly and Cal slowly mutating into green skinned creatures, an ever dwindling supply of food, and a plethora of monsters trying to kill them, what will the future hold for these castaways? "Lost in a tear in the Earth, pursued by technologies that shouldn't exist for hundreds of years, fighting with monsters that should never exist at all-they were alone and stuck with one another, both attacked and abandoned." M.T. Andersonwrites the fourth installment of the Horizon series which builds the conflict within the group of kids stranded in an alien world and with the creatures of the world. Molly continues to turn inhuman; Yoshi continues to turn angry; Anna continues to turn to scien "Lost in a tear in the Earth, pursued by technologies that shouldn't exist for hundreds of years, fighting with monsters that should never exist at all-they were alone and stuck with one another, both attacked and abandoned." M.T. 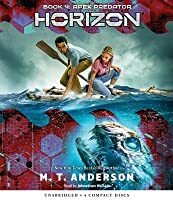 Andersonwrites the fourth installment of the Horizon series which builds the conflict within the group of kids stranded in an alien world and with the creatures of the world. Molly continues to turn inhuman; Yoshi continues to turn angry; Anna continues to turn to science; Javi continues to turn to Molly. The four main characters along with five others are desperate to get off the beach and onto the islands they see across the horizon, but they have many obstacles to face and more monsters lurking beneath the water and beneath their own skin. No spoilers, but this is a well-timed and wonderfully crafted installment in the series. I've been reading this series with my children and this installment pivots the story with thoughtful character growth that was missing from the previous book. We really enjoyed Apex Predator and are now very excited about the next episode in the series. The suspense of wondering who or what trapped the teens in the rift is getting more intense. The tension among the teens is getting stronger but at the same time more of them are seeing the need to work together. Terrific series! I think that it was a good continuation of the series and I can't wait for the fifth book. I really love this book! I have always loved reading books about the future and this book is telling what the kids think about what the future looks and is.Way to go M.T Anderson!!! 5 STARS! I did not enjoy this authors style as much as the other three. TERRIBLE ENDING, especially since book 5 is not out yet.